in Ray, Sonora, and mining. Used by permission. *Some photos added. My introduction to Ray was in 1960, springtime I think. I lived in Ray until I moved to Kearny around 1964 or 65. I was living in Tucson with my parents, I had gotten out of the Navy about 6 months previous and jobs were amazingly scarce. A friend and I saw a help wanted ad in the paper, it was from the Arizona State Employment Service, and said "Workers wanted, Northern Arizona copper mine". We immediately went to the employment service, and there was a huge line waiting to apply. So we called them instead, and asked who was hiring. They would not tell us, but said they could tell us where it was, and it was in Ray. We immediately drove to Ray and went into the mine office. I think they thought we were sent by the employment service, and we were put on the payroll that same day. We were to be haulage truck drivers. We were also the first ones to get there. When we were hired, it was Max ShakeMore by Ken Shake who did the hiring. Max was an interesting fellow, and he seemed to be involved in a lot of the mine decisions as well. He was a nice fellow and we all liked him. We then started looking for a place to rent, and luckily there was a house in Boyd Heights available, so we rented it. A quick run back to Tucson to get some stuff and then back to Ray to move in so we could show up for work the next day. We were assigned to be with another driver for several days until we had learned the ropes. At this time the mine was using Euclid trucks, 50 ton capacity, these were side-boarded to carry about 70 tons. They had dual rear axles. I had never seen a truck that bigyoutube video of Ray Mine ore hauler. in my life. It was like driving and looking over the roof of a house. We quickly picked up the necessary skills and in a few days we were veteran "Euc Skinners". These trucks had two large diesel engines (some Cummins and some GMC) driving two large Allison Torquematic transmissions; each transmission fed one of the two rear axles. The cooling shutters were always wide open, blasting hot air on the cab, and the transmissions would run at 250 degrees going uphill, and we were sitting right over them. You would drink an amazing amount of water on a hot day. If you were hauling from the bottom of the pit, it often got up to 120 degrees down there. Kennecott would not allow air conditioning, they were afraid of maintenance problems and that drivers would shut down if the A/C were to fail. There were no mufflers; the only sound reduction was from the turbochargers. They were really loud. Older more experienced drivers would use earplugs, but we younger fellows were more macho and did not. As a result, many of us now have hearing loss. I don't remember how many shovels the mine had, but there were normally four in operation at any one time. These were electric shovels, and they would have a very large cable for the power. Once in a while a cable would fail, and the flash and noise were amazing. When the shovel moved from one spot to another, someone would have to pull the cable along with a big pair of tongs so it would not get caught or run over (we called this "pulling horsecock"). One would be loading ore which went to the crusher (we called this the "ore drag") and three would be loading either leach (very low grade ore) or waste, which went to dumps beyond the edges of the pit. The ore drag was considered the worst assignment, because you had to make a lot more trips, as the crusher was located right on the edge of the mine. Some of us liked to keep busy, and we would ask for the ore drag. I was one of those. The long hauls out to the leach and waste dumps were really hard on graveyard shift; it was very difficult to stay awake. The mine operated 24/7 on three shifts. Operators rotated shifts every two weeks. Two weeks on days, two weeks on graveyard and two weeks on second, then do it again. Some fellows would trade shifts with other drivers to say on second or graveyard shift. When I started going to school at ASU in 1965, I traded to stay on graveyard, and did that for several years. Each of us had his "own" truck. Each truck was owned by three drivers, one from each shift. We were always careful to keep the truck reasonably clean for the other two drivers. We hated it when our truck was down for repair and we had to drive a spare. When it rained, there would be an incredible amount of mud, and sometimes we would have to stop at a water stand (where the water spray trucks loaded) and spray mud off the cab so we could see where we were going. The brakes were always bad, and when it was muddy and they got wet, we often had no brakes at all, which made things interesting. We would depend on the retarder to keep from overspeeding on the downhill run, and use 1st forward and 1st reverse to stop and start at the edge of the dump and when backing under the shovel. When the roads were wet, they were very slippery, and we were quite skilled at keeping the truck in a straight line even though it was like being on ice. Some of us could slide at will, and would let the rear end slide out and scare the daylights out of the driver of a pickup that was going the other way. We would straighten the truck back out in time, but it was always worth a laugh. Since the trucks had dual rear axles, they were easier to control on slippery roads than single axles would have been. At that time it was Kennecott's policy not to buy single rear axle trucks due to directional stability problems, but as time went on, more and more single rear axle trucks began to appear. Tire technology improved and it was possible to get tires that had enough load capacity that four of them on one rear axle would be enough. When the Euclids were designed, the only way to get enough load capacity was with eight tires on the rear. By now almost all trucks are single rear axle, and certainly much larger than the 70 ton Euclids we drove. There were always plenty of old mine timbers around the shovel areas from the former underground mine, and we would burn these in a fire usually close to the lunch table. At lunchtime, especially on second and graveyard shifts, we would eat our lunches around the fire and tell stories. The timbers burned with God-only-knows what chemicals coming off, with blue and green flames; the smoke would really bother your eyes and nose, but it was the only wood we had. One fellow I remember well was "Comrade". I don't remember his actual name but we all called him Comrade because he had a history of having been active in socialist organizations. He was a master story teller, and I can still remember some of the stories. It was always a treat to sit around the lunch fire with him. Those of us who smoked (most of us) would notice that when you were around dust from the ore shovel the cigarette tasted very sweet. As for dust, there was always plenty of it. There were several water trucks that sprayed the haul roads, but they would dry out in a few minutes. There would be two bank sprays above the shovel, but they could not compete with the shovel scooping multiple cubic yards of rock from the bank again and again. We were issued simple dust masks with paper filters, but almost no one used them, they did not fit well against the face, they were hot to wear and just a pain in general. Most of us were aware of silicosis, but the masks were so uncomfortable that we took the risk. The mine manager at the time was Bob Winkle, and I owe him a great debt. I was trying to better myself by being promoted to truck foreman, and Bob called me into his office and told me that I could have the job, but that he hated to give it to me. I asked him why, and he said that I had more potential than that, and if I took the position I would make just enough money to never leave and better myself. Right then I made the decision to turn down the job and start going to school. I enrolled in the Engineering program at ASU and started driving back and forth daytimes and working in the mine at night. Some years later, when I was working as a mechanical engineer for Caterpillar, I had a chance to visit the mine and thank Bob for what he had done for me. He was really pleased at my success, and I made sure he knew what an impact he had on me. Oddly enough, most of the fellows in the mine disliked Bob, because he would not take the union point of view on many issues. I always got along just fine with him on union matters. labor relations.. President was usually Charlie Morse or Morris (I'm not sure about this name) and the local fellow who was responsible for relations with the International was Kermit Hoyt. Kermit was a fairly reasonable fellow, worked hard, and wanted to be hired by the International as a union representative. Charlie was content to be president of the local. Charlie was a shovel operator, a bit of a hot head and was usually in some union-related squabble with the mine management. I was vice president of the local for one term, but since I preferred to solve problems with a conversation with management instead of filing a formal grievance and going through a long process, my credibility with the rank and file was not so hot. Union success was measured by the number of grievances and the number won. There were no points or honors for settling problems face to face with management. At that time there were two towns separated by the pit. Ray was on the east side and Sonora was on the west side. Sonora was Mexican and Ray was Anglo. I don't remember Barcelona. 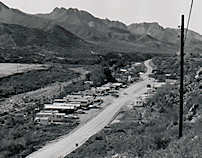 The main street in RayColor photo, downtown Ray (Judy Jones) had two grocery stores, a restaurant, a hotel, a drugstore, a movie theater, a post office, and several other businesses. The grocery stores competed against each other; one was owned by George Milton and was called The Ray Market. The other was owned by Allie Hing (not sure of first name spelling) and was called (I think) Miner's Mercantile. Allie would give credit, George would not. Allie was the favorite of the union folks, since he would extend credit through a strike. The restaurant was run by a Chinese fellow whose name was Yee Tung Gay but everyone called him Chuck. He had a pretty good menu, and apparently learned to cook at that restaurant. His English was not too good, but the food was fine. There was a problem with his work permit, and I remember writing a letter on Union letterhead to our State Senator Carl Hayden asking for his help. He came through, and Chuck stayed in town. 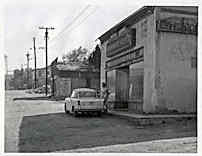 There was a gas station just north of downtown, it was owned by several fellows at different times. One I remember was L.D. Poor; I think he was the last owner of the station. When a car pulled into the station, the tank was filled, the windows were washed and the tire pressures were checked if the driver wanted. Full service! 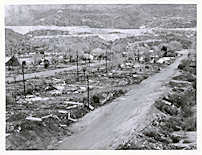 The two main residential parts of Ray were Boyd Heights and Thomas Terrace. Thomas Terrace had prefab homes made of concrete. 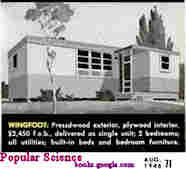 Boyd Heights had two primary types of housing, Wingfoots and small two bedroom bungalows. The Wingfoots were very small, about the size of a small house trailer. All were pretty old, with more or less primitive kitchens and bathrooms. Yards were very small. You could buy the house, but the ground belonged to Kennecott. There were also homes just east of downtown on the hillside, where the school was, but I do not remember what this area was called. If you went out Mineral Creek road to the north-east, there was a trailer park up on the hillside, maybe 30 spaces. Past this there was a bar. I don't remember the name. It seemed to be fairly popular and I remember you could get a pizza there as well. Beyond the bar you would be on property owned by Ralph Dubois, I think it was called the Hidden Ranch. He had a lot of land holdings in the area. He was also a Euc Skinner, and rode an old Harley Davidson to work no matter the weather. No one every saw him spend any money, and it was reputed that he would often leave his paychecks at the office for months. I don't know if this was true, but Ralph was an interesting fellow. On the other side of the creek was a road which took you to the cemetery and to the dam on the creek. We would often fish in the small lake behind the dam. On the other side of the pit was the town of Sonora. Going to Sonora was just like a trip to Mexico. The language was Spanish, the signs and storefronts were all in Spanish. The culture was Mexican-American, with a strong emphasis on family ties and tradition and little concern with property appearances. The homes and stores in Sonora all appeared to be ramshackle, but once inside they were spotlessly clean and neat. A favorite spot was the small store of the raspada lady; she would sell shaved ice in cones with flavoring and shave the ice right in front of you. These were called raspadas. There was a clothing store owned by Kelly Haddad, who was Lebanese and greatly loved by all in Sonora. He was also the Justice of the Peace, so he was fairly important to the community. 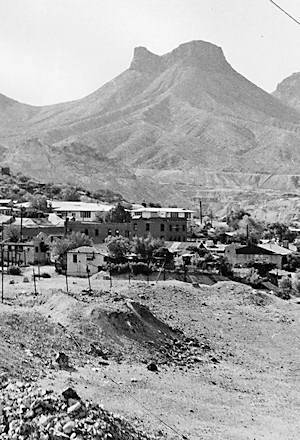 About half the workers in the mine were Mexican-Americans, and I was initially fascinated by the way they would shift from English to Spanish and back again in the middle of a sentence during lunch table conversation. I very much enjoyed these fellows, and got to know some of them very well. (I also learned to swear in Spanish very well). At their parties, there would always be beer and singing. Anglos didn't sing much if any, but when a group of Mexicans get together there will lots of song and guitar playing. By then I was learning enough Spanish to converse and understand. The Mexican fellows in the mine always had a nickname. It was very rare for one of them to be addressed by his regular name, at least by another Mexican. Chui, Gordo, Neto, Pancho, Chepe, Quapo, Chico, there was a long list of nick names. For lunch they would almost always have a burro or two, and we Anglos would sometimes try to trade our sandwiches for the burros. Everyone had a stainless steel Stanley thermos bottle for his coffee. There was a medical clinic in Sonora and the company hospital in Ray. The doctor at the Sonora clinic was Doctor Walsh, he was very old, and spoke Spanish with an American accent. He was also very much loved by the Sonora residents. I remember he drove an older Cadillac, maybe 1946 or so. In Ray, there were three doctors. I can remember Doctor Ehrmann, but the other two names escape me just now. I met my first wife in Sonora during the celebration for the 16th of September. Her name was Armida Verdugo and her parents were Ernesto and Josefina Verdugo. Most of the town would turn out for the celebration, and there was a lot of beer consumed as well. This was in 1962. We were married in 1963 (we eloped to Lordsburg NM which had no waiting period) and then again in a church ceremony later that year. The reception was at the Cosmopolita building, which had been a hotel. It was a traditional Mexican reception with barbecued goat, mariachi band and plenty of beer and dancing. Our first son, Tommy, was born in October 1964 at the new hospital in Kearny. 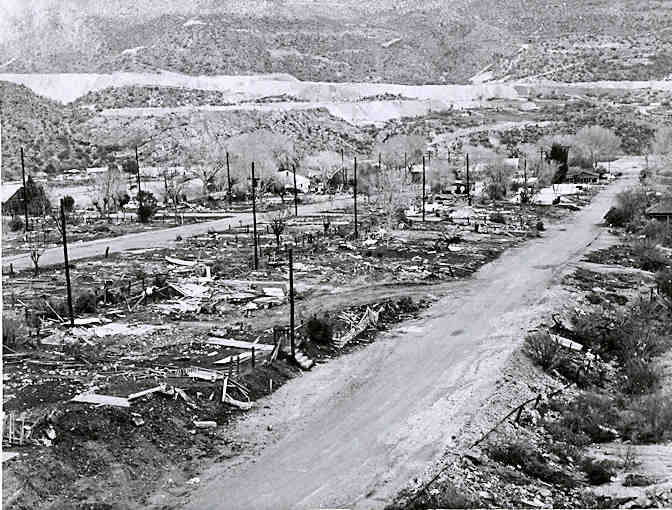 About this time, we were told that all homes in Ray and Sonora would have to be removed or abandoned because the mine was expanding. There would be no compensation from the mine. We were on our own. 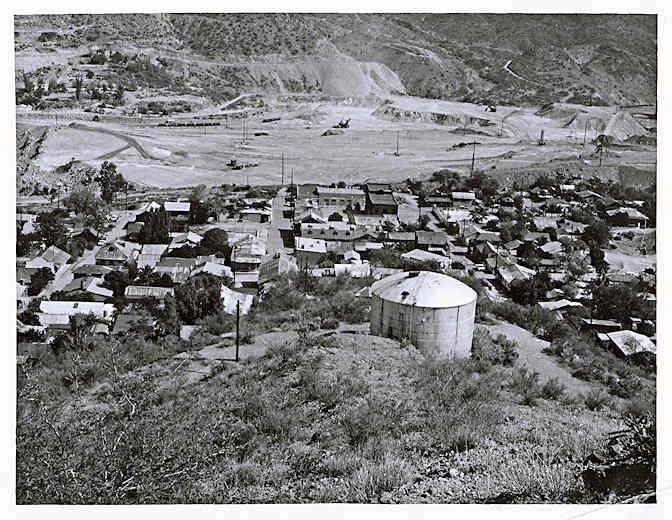 Earlier, in 1958, Kennecott had worked through John W. Galbraith Development Corp. to build the new town of Kearny and tried to convince the current residents of Ray and Sonora to buy a home there and move to it. There was a lot of opposition to this. Most people were living in homes that had long been paid for, and the idea of making house payments all over again was not well received. The homes in Ray and Sonora were small and old, and the homes in Kearny were new and larger, hence more expensive. This was a disruptive time for all. At that time we were living in a house trailer at the trailer park, and we were given a notice to vacate. 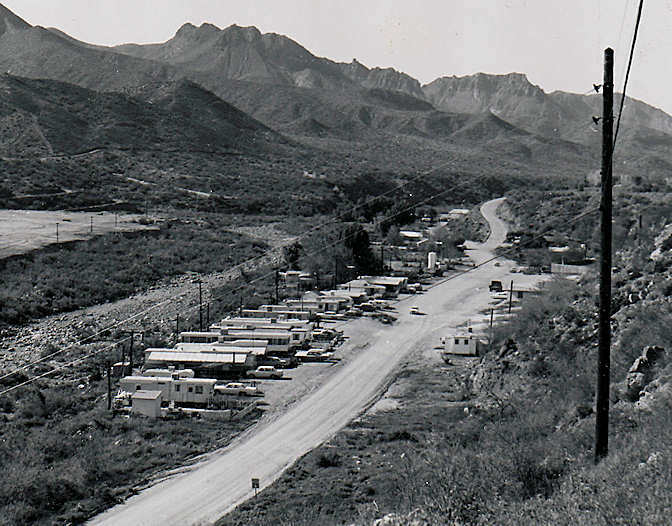 Allie Hing, who owned one of the grocery stores in Ray, somehow bought some property alongside Mineral creek road, and built a trailer park there, just down the hill from the original park. It quickly filled up, and we were one of the new renters there. The trailer park photo shows Allie's court, not the original one. He also built a fairly crude shopping center on the other side of the road, but it was never successful. I understand that he later sold the property to the mine for a substantial sum of money. Allie was quite the entrepreneur, and he also started a house moving business and it was his company that moved most of the homes out of Ray and Sonora. Most of the homes in Sonora could not be moved, and they were abandoned after the owners stripped out what could be salvaged. Some of the homes in Ray, mostly the bungalows, were movable.Many people bought home sites in Superior or Riverside and moved their homes there. Some of the Sonora residents bought bungalows for very low prices from owners in Boyd Heights who did not want to mess with moving a house and then moved them to another home site. My father in law Ernesto Verdugo did this, and moved the house to a lot in Superior where he lived until he died some years later. I don't remember what he paid for the house, maybe $800. Allie Hing also had some property several miles north of Ray, he sold several sites there and there were maybe eight houses moved to it. We called this new place "Hong Kong". I think all the homes there are gone now. And many people, not having a lot of options, bought homes in Kearny. We sold our trailer and bought a home in Kearny in 1966. It is hard to verbalize all the emotions and feelings that this disruption in everyone's lives caused. For some years you could stop at a lookout to the west of Sonora and see where the town was and some of the abandoned buildings, but I am told this is now closed. All of Ray is gone into the pit. 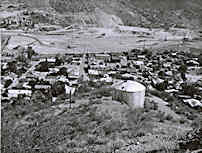 I left Kennecott in 1968 and moved to Phoenix to finish getting my degree at ASU. I graduated in 1970 and moved to Peoria IL for employment with Caterpillar Inc. Assembled by ovk. Last reviewed 11/24/09 (Orig: 11/24/2009).